Dougie Vipond, Andy Nicol and John Barclay are in the studio with John Beattie and Chris Paterson providing commentary. There might be a sense of deja vu about this summer’s tour schedule for Scotland. 4 years ago the dark blues also tackled Canada, USA and Argentina – although at least there’s no 5,000 mile trip to South Africa tacked on at the end of this season’s travels. This should (hopefully) be the last of the “bits and pieces” tours for the national side though. Following the 2019 RWC Scotland will rejoin the top table, including 2 and 3 match series against all of the Southern Hemisphere’s Tier 1 nations during the next 10-year cycle. The aim to grow the game globally will likely mean more 2 test tours for all concerned, to provide more nations with meaningful games during June. It may actually be the last time taking on the North American nations on their own turf for a while, so let’s enjoy the opportunity to develop some new caps and younger players with a seriously challenging 16 months ahead, running through to the Rugby World Cup in Japan in the Autumn of 2019. First up this summer – it’s Canada. This will be just the third match against a Tier 1 side for Canada since the last World Cup. They lost narrowly (18 – 20) at home to Italy in summer of 2016 and later that year they were well beaten (21 – 52) by Ireland in Dublin. Canada have been to all eight previous Rugby World Cups but that proud record is under serious threat ahead of the 9th edition in Japan next year. Having missed out on the Americas 1 place to USA, the Canadians then slipped to defeat against Uruguay in the battle for the Americas 2 qualifying slot – losing both the home and away leg of their playoff against Los Teros. There is one final chance for the Canucks to make it though. A four-team repechage will provide the 20th team to join the RWC action in 2019 and a place in Pool B which includes both New Zealand and South Africa. Glasgow Warriors’ own Canadian sensation DTH can der Merwe is still providing the firepower for his adopted country – and will skipper them throughout this summer’s action. With 99 career tries already on the board (47 for Glasgow, 32 for Canada, 19 for Scarlets and 1 for Newcastle) could DTH bring up his own personal century of scores against a side packed with his Warriors’ clubmates?. Flanker Lucas Rumball has only missed a handful of games since making his Test debut as a 20-year-old in February 2016. Now 22 he’s already picked up 20 caps while playing across the back row for his country. Named as Canada’s top young male player in his teens and having captained the Maple Leafs in the World Rugby U20 Trophy he’s been earmarked for success from an early age. Mostly featuring as an oversized (6’4″) openside, if selected he’ll provide a physical test for young Jamie Ritchie, who has the 7 shirt for Scotland. It’s the summer tour so it’s that time of year when Scotland get a rookie official for one of his first tastes of taking charge of a Tier 1 side. After Ben O’Keeffe (New Zealand) for the opening game of the Japan series in 2016 and Paul Williams (also New Zealand) in last year’s match against Italy in Singapore, Kubo-san will be the latest ref to provide a fresh challenge for the Scottish players to figure out. Discipline in the early part of the Townsend era has been reasonably good. Scotland have managed to average single digits for penalties (9) across Toony’s first 11 matches in charge (their opponents have conceded 11 per game). There have also been just 2 sin bins so far while the Scots have benefited from their opponents giving up 1 red and 9 yellow cards. As you’d expect against the side who (given performances mentioned above) could be considered the weakest, Scotland’s 23 is experimental. Grant Gilchrist will skipper the side (for the first time since 2014) in the absence of tour captain Stuart McInally. With Rambo out, the front five is much as could be expected from the personnel available, with Fraser Brown filling in and the only big difference from recent teams being Allan Dell returning at loosehead. After that, things go full Tombola with David Denton the voice of experience in the back row and Magnus Bradbury and Jamie Ritchie the flankers. There’s a brand new half back pairing of Sam Hidalgo-Clyne and Ruaridh Jackson (who has played fullback all season) and a new midfield of James Lang and Chris Harris. Blair Kinghorn will earn his first start at fullback but expect him to shift to the wing should he play well enough to escape any Night of the Long Toonies that could follow an underperformance as we saw in Fiji last summer. Relative to the Scotland touring squad as a whole, the bench is actually pretty strong with Ali Price, Jamie Bhatti and Mark Bennett all guys who have regularly started for Scotland in the past or recently. The opposition may be “only” Canada, but Townsend is clearly setting a challenge to these players – prove you are good enough. With the home side sure to be fired up, and led by DTH Van Der Merwe, they won’t have long to do so. 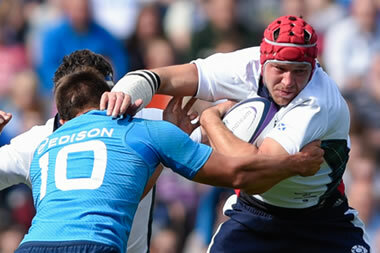 Scotland XV: Blair Kinghorn, Lee Jones, Chris Harris, James Lang, Byron McGuigan, Ruaridh Jackson, Sam Hidalgo-Clyne; Allan Dell, Fraser Brown, Simon Berghan, Ben Toolis, Grant Gilchrist (capt), Magnus Bradbury, Jamie Ritchie, David Denton. Replacements: George Turner, Jamie Bhatti, Murray McCallum, Lewis Carmichael, Luke Hamilton, Ali Price, Adam Hastings, Mark Bennett. Blimey the Toony tombola is spinning at 1400rpm with that backline selection. Pack looks solid enough to win some ball so it will be interesting to see what the backs do with it. A good chance for a few boys to put their hands up for further caps next year. It looks a decent side with a very good pack (all Edinburgh plus Denton). I’m very excited to see what James Ritchie can do as I reckon he’s the future for our back row. My opinions on Harris and to a degree McGuigan aren’t high, but I’m pleased to see them given a shot against Canada – basically if they can’t perform against them then they don’t deserve to be anywhere near the 23. James Lang is an odd choice at 12, but from what I’ve seen of him he’s very quick and can spot a gap, plus he’ll have good distribution being a 10 so it should work. Even though it’s only a friendly I’m already excited to see how we fare. Agreed that the pack looks good. Perfect opportunity for a few of these guys to stick their hand up for the first team. Bradbury and Ritchie have been excellent all season and Berghan is like a different player. Absolutely no idea what to expect from the backline… Jackson at 10 doesn’t excite me but probably the most sensible decision given the lack of experience elsewhere. Really can’t see him making the WC squad though, either as a 1o or 15. Excited to see how Kinghorn goes at fullback, probably the most exciting back in the pro 14 this season, and Jones provides a nice, reassuring presence on the wing. I cant help feeling Jamie Ritchie is Embra’s equivalent of Rob Harley, not convinced he will be much more than an excellent club pro. Hope I am proved wrong though. I think that’s a bit unfair on Ritchie. He’s had a great season, been a big factor in the success of Edinburgh’s forwards, his breakdown work is superb. Strikes me as an O’Mahoney style player – does a lot of the dog work, glues everything together, makes a nuisance of himself. He’s already a better ball carrier than Harley. I suspect you’ve not seen much of Jamie Ritchie if that’s your opinion of him. He’s only 21 and has been a near regular in the Edinburgh side since he broke into the team. He is a big lad, who carries well and is a nuisance at the breakdown. He was sorely missed by Edinburgh in their game against Munster in the playoffs. I wouldn’t be surprised if he goes on to captain Edinburgh & Scotland. Canada are a nothing side these days. We will hammer them. USA won’t be the same though. Why have Jackson at 10 when we have Lang and Hastings?whats to learn there? This is the game to experiment. Mcguigan is a top domestic winger, there on merit. Harris has had an exceptional season domestically in a top 4 side. He will come out of this tour looking good. Argentina will beat us. Disappointed Hastings isn’t starting to be honest, like others can’t see Jackson in the RWC squad and if he starts any games there it probably means we’re f*****. Thought his game against Japan two years ago was his last shot at this level but I guess Toonie knows him well. Really need to put away Canada well. I’m all for Jacko in the squad, he’s a very handy and accomplished utility reserve but starting at 10 against Canada seems like a wasted opportunity to see Hastings or Lang and if you are going to start Jacko why not pair him with Horne. HC is an established pro, Horne is still green. Toony is looking at Lang only as a 12 at this point, they think the way he plays fits the way Scotland see the 12 role. My guess is that means Pete Horne with added physicality but I haven’t seen Lang play so not sure if that is accurate! Happy to see Harris getting another chance, he was crap THAT day but then so were many of the supposedly much more illustrious others. Also good to see Luke Hamilton back, I liked the look of him in the brief time he played (was it the AIs last year?). Other than that a not bad team, good to see Bradbury getting a run out interestingly looks more like a bash em up back row than a jackling one. Hastings will get plenty of game time. Jackson is a safe pair of hands to start the first game with. God remember the days when a young Ruriadh Jackson was literally the messiah coming to save us from Godman and Parks? *shivers*. On a final note our away record to Canada isn’t that great is it, one loss and a narrow win. I would settle for beating Canada and the USA and having a decent game against the Pumas regardless of the result. Really strange team. Don’t know why certain players are starting. Would much rather see the new guys instead of bang average players who have been given plenty of chances and never done anything to justify a place (slightly harsh on Denton). V harsh on Denton who was great at RWC15 and Harris who has had one anonymous game on the wing and one nightmare in 6N massacre. Plenty of chances? You are right , Denton has never fulfilled his promise. Just not hard enough. If we were playing the Ivory Coast he might stand out , but against the grown ups, he shrinks back into his shell. Now that is V harsh but not a lie either. Did you watch the QF against Aus? Denton was excellent against the eventual finalists. Yes I did, thank you for reminding me of his key part in the darkest few seconds of Scottish rugby’s history. I do not recall him standing out other than failing to collect the (daftest line out call aside) ball at the tail, taping back and the rest is history. You have answered my challenge. That long ago !!!! The last time anyone can recall him playing a decent game ? He was average and just didnt play a bad game IMO. Well maybe thats unfair as he has not been picked, the selectors dont like him either !!!! He has struggled to get an AP side to take him seriously, come off it, we think this man is the backrow god we are waiting for !!!! Are we really that hard up ! The 16th man in every AP premierships wish list is Scotland’s new hope. This guy is average and simply not tough enough. Not a bad quality in life, just not what we need right now. He was on form throughout the RWC, including that game, which lead to people discussing his potential as a Lion and Bath buying out his contract att Edinburgh. Yes, he’s been injured and out of favour, but he was very good for Worcester this year and good in his 6N cameos. I really don’t get the hate for him. He’s not a jackal like Watson and Barclay, but he hits and carries hard. Think you are being massively harsh on Denton. Don’t get me wrong he is a bit of a one trick pony (doesn’t really pass much) but at the WC, as mentioned, he was a standout and moved to Bath as a result. He was then injured and played out of position (never a 7) and had to compete with Talupe Faletau, who was their first choice before Denton signed. Possible biggest backrow we’ve fielded in a long while? Certainly a different approach to what we’ve seen with Townsend’s selections in the past. Great to have a different option. Is it just me or has Denton added a lot of beef since he moved south? I used to think of him as almost rangey and now he is is just a big solid unit. It’s no secret that we are sometimes vulnerable to our back row being walked over the top off by our opponents. The England game being the exception to the rule. This back row is the best part of 30kg heavier than the Wilson/Watson/Barlcay combo of last year. Looks like a reasonable mix of old and new. I don’t mind Jackson at 10 to start the game with a newbie outside him and another of the bench; he’s been steady all season (if not at 10). Are there a few players who might be looking at the last chance saloon? I’d be worried about talking down Canada; 1) we know how poor our away record has been recently and 2) we know how bad we are when we’re supposedly clear favourites. Hopefully Toonie can work on both these issues for this game. I’m sure this is the start of a three game selection process, with the Argentina game probably being the one for which the strongest team that can be mustered from the touring squad is picked. So I wouldn’t read too much into the starting XV for this one. It is also ( banana skin anyone ) the nearest thing we’ll get to a trial game for some of the squad. I’m a Jackson fan, and still think he is potentially our second best 10. But his almost total lack of recent game time there, with a monumentally inexperienced pair of centres, is a bit worrying. I assume SH-C will take the place kicking duties. Like you I hope he plays well but an average game is all we need from him. He has a lot of experience and is a safe pair of hands. The others will step up and having a predictable FH will give the right platform for that. I wonder if with Finn away to Paris that Jackson may play a lot more 10 at Glasgow this year. As I see it Townsend needs to work out who his second 10 is and this tour is a big part of that process. I would expect to see Hastings start one of the games. Ps who will be taking the kicks? SHC? As much as he majority of us want to see Hastings at 10, it would be a big ask to start him there with the rest of the backline that has been picked. You need some sort of steadying influence and Jackson is a safe pair of hands. I wonder if there will be an en bloc change fairly early to put Price, Hastings and Bennett on at the same time (maybe move Jackson to fullback at the same time). Canada aren’t looking great at the moment, and this is a development tour, but we do run he risk of losing which wouldn’t be great for building confidence. Let’s hope Lang does well and Harris proves everyone wrong! There’s a few guys in this team that could be outside picks for the World Cup if the do well. Good to see Hamilton there as I thought he was very impressive in his brief appearance in the autumn. Fairly decent pack and an intimidating (if callow in parts) back row. I think it’s good to have a brutish back row option in the armoury – we’ve been undone there in the recent past, so it’ll be interesting to see how that goes. Hamilton adds even more strength from the bench. Not convinced that 11 – 14 looks international class (although I do like Lee Jones and have enjoyed his resurgence). Does any one know if you can watch on iPlayer from London? change the settings in the iplayer app, to “scotland” in region. Then you’ll be grand. I see the handicap is 21 points. I think I’ll have Canada at those odds. The 10-12-13 combo for us will be interesting, Jackson (not played 10 in a year), Lang (no one had heard of before selected), Harris (Not looked comfortable in a scotland shirt yet to put it politely). Expect DTH to be hitting lines to their channel all day long. As a Scot living in England I never cease to be amazed at the parochial nature of Scottish rugby fans to other competitions. James Lang has almost 1000 minutes of first team rugby this season for a premiership side. He’s a regular premiership player. To say no one had heard of him is disrespectful. He’s a more established “name”in rugby than many of the Scots newbies. He’s a better 10than Hastings by some distance. Fair enough JP… a scot living in england and im guessing watches the AP regularly ? , if he was a far better 10 that Hastings why has he not had a look in over the past year or 2 when we have desperately needed a decent 10 backup ? Mabey people in his league has heard of him, but he clearly has not been a standout player over the season or people would of been talking about him getting selected as even a bolter before the squad was announced. I don’t recall anyone on this website mentioning him before toony picked him. Not saying he is a bad player, but who north of the border actually knew of him ? I knew about him but and had mentioned him on here but suspected he was holding out for a Wales call up to be honest. Lang and Harris are both very talented players and if Canada are expecting to get any change out of them they’re in for a shock. I support Edinburgh so watch P14. I also follow Super rugby, T14 and prem because IM A RUGBY FAN. Hastings wouldn’t be near the starting line up at Quins just like he wasn’t at Bath. The comment below is likely accurate, we were his back up after Wales but as a 10 I’d guess he correctly sees less competition with scotland and a 2019 spot which he wouldn’t get with Wales. My point isn’t to bash Hastings but Lang is a player at this stage who is better equipped for international rugby. Neither are world class but it’s mad given our options at -0 that Lang Seems to be viewed as a 12 in the set up. My biggest concern for this game is an inspired DTH running rampant at an inexperienced back line. If we don’t get the midfield defensive pattern right it could be a long evening. We should have too much up front to lose this game but the favourites away from home tag doesn’t sit well these days. Japan just beat Italy 34-17. They’re not going to be any kind of walkover in the RWC. I can see Japan playing a blinder. They will work so hard to succeed in their own WC I’ll go against the grain and suggest they have a strong chance of winning 3 out of 4 pool matches. I might have spoken too soon…..
Worth noting that Vermulen is currently unattached – miracle Rennie signing for Glasgow? Probably more likely than a SA P14 unless their salaries are more NH than SH? Would be a great signing for glasgow and wouldnt object to spending everything we have on him over a a bunch of lesser people. Would be amazing, but it’ll never happen. Have to say i enjoyed that england pack getting battered by SA. I know this is a Scottish blog, but while we’re on the subject of England today, I counted two possibly three late/ high hits by Itoje on the Saffer 9 that seemed to go unnoticed let alone unpunished. Poor reffing/tmo’ing imho. You think that’s bad, the Welsh game has a Welsh ref! Absolutely this – utter nonsense. But of course the C4 commentators ( all Welsh ) don’t seem to want to mention it. In the same way no one mentioned an asst ref from Dublin running the line for Leinster in the CC final. After the World cup qualifying debacle you’d think someone would get a grip. Think they did mention. Right at start of game. I thought Brace had a good game but agree he, as a person, didn’t need to put in that position. World rugby being a bit brainless. Perhaps getting a bit ahead of myself but we will play either NZ or SA in the World Cup QF, assuming we can beat Japan. My personal preference is to play New Zealand. I think SA in a knock out game would be too physical for us. Any thoughts? Regardless, Townsend needs to build belief in the squad that we can beat anyone in a truly neutral venue over the next 15 months.